Thousands of Cameroonians have planned a protest march today to storm the Yaounde Conference Centre as the Cameroon constitutional council is set to proclaim the winner of the October 7 presidential election. The call for protest is coming after the council rejected all the post-election petitions filed in by the some 3 opposition parties demanding the total and partial annulment of the results which they claimed were marred by irregularities. 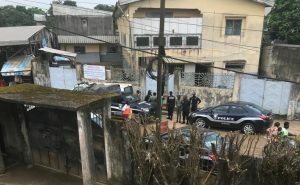 Last night, reports went viral on social media that the campaign manager of Maurice Kamto, Paul Eric Kinge has been arrested, while other report says his house in Yaounde has been surrounded by security forces. As a matter of fact, security has been strengthened all over the country for any eventuality that might come up as a result of the declaration that will commence as from 11am today. In Buea, the security forces arrested so many youths on October 21 in Bunduma and as we write gun shots can be heard coming from that area. 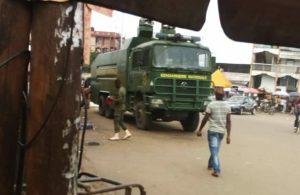 Today’s protest will be coming barely 24 hours that the Cameroon security forces frustrated another protest march in Douala that was organised by the Social Democratic Front’s Littoral chairman Jean Mitchel Nitcheu. The organiser as well as other activists, were put under house arrest and protesters who dared to show up at Rond Point Dhakar Douala were arrested. According to social media sources, Journalists were equally arrested. All these calls for protest are based on the fact that the incumbent President Paul Biya of Cameroon will still be proclaimed winner. After the exit Polls, the Cameroon Renaissance Movement Candidate, Professor Maurice Kamto claimed Victory on the 8 of October but later called for partial conciliation of results in other regions as he said the results in those areas were tailored in favour of Paul Biya. On Saturday 20th, hundreds of Cameroonians in Germany equally went on the streets protesting against the imminent victory of Mr Biya. According to them, the constitutional council was biased in its judgement against Kamto. The protesters called for Biya to step down and hand power to Muarice Kamto. While the winner will be known in few hours from the time of this report, the president of Equatorial Guinee Teodoro Obiang Nguema two days ago sent his congratulation messages to President Paul Biya who is seeking another 7 year term after ruling Cameroon for closed to 40years. Hello, Neat post. There’s a problem with your web site in internet explorer, may test this… IE still is the marketplace chief and a huge section of other folks will leave out your fantastic writing due to this problem. I simply want to mention I’m all new to weblog and certainly enjoyed your web-site. Very likely I’m planning to bookmark your site . You certainly have fantastic well written articles. Regards for sharing with us your web site. I have been browsing online greater than 3 hours nowadays, yet I never found any fascinating article like yours. It¡¦s pretty worth sufficient for me. In my view, if all site owners and bloggers made good content material as you probably did, the web can be much more useful than ever before. I intended to draft you a tiny note to finally say thanks a lot again about the wonderful ideas you have documented above. It is quite wonderfully generous with you to allow unhampered precisely what numerous people would’ve made available as an electronic book to get some dough for their own end, certainly given that you could possibly have done it in the event you decided. Those pointers as well acted to provide a easy way to fully grasp other people have the same fervor the same as my own to figure out much more with regard to this issue. I think there are millions of more fun moments in the future for individuals who take a look at your blog. Wow, superb blog structure! How long have you been running a blog for? you made blogging look easy. The full glance of your website is magnificent, as neatly as the content! Thank you for sharing excellent informations. Your web-site is so cool. I am impressed by the details that you have on this site. It reveals how nicely you understand this subject. Bookmarked this website page, will come back for more articles. You, my friend, ROCK! I found just the info I already searched all over the place and just couldn’t come across. What a great site. Great amazing things here. I¡¦m very happy to peer your post. Thank you a lot and i am having a look ahead to contact you. Will you kindly drop me a e-mail? I just want to say I am just newbie to blogs and truly loved your web blog. More than likely I’m likely to bookmark your blog post . You surely have impressive writings. Thank you for sharing your web-site. I¡¦ve been exploring for a little for any high quality articles or blog posts in this kind of area . Exploring in Yahoo I eventually stumbled upon this web site. Studying this information So i am happy to express that I have an incredibly good uncanny feeling I came upon just what I needed. I such a lot indisputably will make certain to do not forget this site and give it a look regularly. Just wish to say your article is as astounding. The clarity in your post is just spectacular and i can assume you’re an expert on this subject. Well with your permission let me to grab your RSS feed to keep up to date with forthcoming post. Thanks a million and please keep up the enjoyable work. Simply want to say your article is as astonishing. The clearness in your post is just nice and i could assume you’re an expert on this subject. Well with your permission allow me to grab your feed to keep up to date with forthcoming post. Thanks a million and please keep up the rewarding work. Hi my family member! I want to say that this article is amazing, nice written and come with approximately all vital infos. I¡¦d like to look extra posts like this . Thanks for some other informative site. Where else could I am getting that type of info written in such a perfect approach? I’ve a challenge that I’m just now working on, and I’ve been on the glance out for such info. I¡¦ll immediately take hold of your rss feed as I can not in finding your email subscription hyperlink or e-newsletter service. Do you have any? Please let me realize so that I could subscribe. Thanks. Useful info. Lucky me I discovered your website accidentally, and I’m surprised why this accident did not took place in advance! I bookmarked it. Wow, fantastic blog format! How lengthy have you been blogging for? you made blogging look easy. The overall glance of your website is great, as well as the content material! Thanks for another informative site. The place else may just I am getting that kind of info written in such a perfect way? I have a project that I am just now operating on, and I have been on the look out for such info. Just want to say your article is as surprising. The clearness in your post is just spectacular and i could assume you are an expert on this subject. Well with your permission let me to grab your RSS feed to keep updated with forthcoming post. Thanks a million and please keep up the gratifying work. wonderful put up, very informative. I’m wondering why the other specialists of this sector don’t understand this. You must continue your writing. I am sure, you’ve a huge readers’ base already! What i don’t realize is in truth how you’re not really a lot more well-liked than you might be now. You’re so intelligent. You know therefore significantly with regards to this topic, produced me individually imagine it from a lot of numerous angles. Its like women and men don’t seem to be involved until it¡¦s one thing to do with Girl gaga! Your individual stuffs excellent. All the time handle it up! Hey there. I found your site by the use of Google while searching for a similar topic, your web site got here up. It appears great. I have bookmarked it in my google bookmarks to come back then. I¡¦ll right away grasp your rss as I can not to find your email subscription link or newsletter service. Do you’ve any? Please let me recognise so that I may just subscribe. Thanks. Just desire to say your article is as astounding. The clearness in your post is just cool and i could assume you are an expert on this subject. Well with your permission allow me to grab your RSS feed to keep updated with forthcoming post. Thanks a million and please carry on the rewarding work. Hey there. I discovered your blog by means of Google at the same time as looking for a related topic, your website got here up. It seems great. I’ve bookmarked it in my google bookmarks to visit then. Hi there. I found your blog via Google even as searching for a similar subject, your website came up. It appears good. I have bookmarked it in my google bookmarks to come back then. Hiya, I am really glad I’ve found this info. Today bloggers publish only about gossip and web stuff and this is actually frustrating. A good website with exciting content, this is what I need. Thank you for making this web-site, and I’ll be visiting again. Do you do newsletters by email? Hiya, I’m really glad I’ve found this information. Today bloggers publish only about gossip and internet stuff and this is actually irritating. A good website with interesting content, that’s what I need. Thanks for making this site, and I’ll be visiting again. Do you do newsletters by email? Hi there. I found your website by way of Google whilst looking for a similar topic, your web site got here up. It seems good. I’ve bookmarked it in my google bookmarks to visit then. Hi there. I discovered your website by way of Google whilst looking for a similar subject, your site got here up. It appears great. I’ve bookmarked it in my google bookmarks to come back then. You actually make it seem really easy along with your presentation however I find this topic to be really one thing that I believe I’d never understand. It kind of feels too complex and very broad for me. I’m looking forward for your next submit, I will try to get the cling of it! I precisely wanted to appreciate you again. I am not sure the things I would have gone through in the absence of the opinions discussed by you regarding this problem. Entirely was a very intimidating case in my circumstances, however , viewing a professional fashion you dealt with the issue made me to weep with gladness. I’m happy for your assistance and then have high hopes you realize what a powerful job you were carrying out instructing some other people all through your webblog. More than likely you have never encountered all of us. I simply desired to say thanks all over again. I’m not certain the things I might have tried in the absence of the entire creative ideas contributed by you directly on that question. It seemed to be an absolute horrifying condition in my position, however , understanding the professional approach you dealt with that forced me to leap over gladness. I’m just happier for your work and as well , hope that you realize what an amazing job you have been providing teaching the rest thru your web site. I am certain you’ve never met any of us. Hey there. I discovered your site by the use of Google whilst looking for a related topic, your website got here up. It looks great. I have bookmarked it in my google bookmarks to come back then. Hey there. I discovered your blog by means of Google while looking for a comparable matter, your site got here up. It seems to be good. I have bookmarked it in my google bookmarks to come back then. Hiya, I’m really glad I’ve found this information. Today bloggers publish just about gossip and net stuff and this is actually frustrating. A good website with exciting content, this is what I need. Thanks for making this website, and I will be visiting again. Do you do newsletters by email? Great awesome things here. I am very glad to look your post. Thanks a lot and i am taking a look ahead to touch you. Will you kindly drop me a mail? I intended to post you the very small remark in order to thank you so much again regarding the great concepts you have featured at this time. This has been certainly generous of you to present unhampered exactly what most of us could possibly have supplied as an e book to help make some dough on their own, particularly given that you could have done it in the event you considered necessary. Those strategies as well served as a easy way to be aware that other people online have the identical keenness the same as my personal own to figure out a great deal more with regard to this condition. I am sure there are numerous more enjoyable situations up front for many who read carefully your website. Hiya, I am really glad I’ve found this info. Today bloggers publish only about gossip and web stuff and this is really irritating. A good website with exciting content, that’s what I need. Thanks for making this web site, and I’ll be visiting again. Do you do newsletters by email? It¡¦s really a nice and helpful piece of information. I¡¦m glad that you shared this useful info with us. Please stay us informed like this. Thank you for sharing. Great awesome things here. I¡¦m very glad to see your article. Thanks a lot and i’m looking forward to contact you. Will you please drop me a mail? Hello there. I found your website by means of Google whilst looking for a similar topic, your website got here up. It seems to be good. I have bookmarked it in my google bookmarks to visit then. Hello there. I found your web site by the use of Google even as searching for a related matter, your site came up. It appears good. I have bookmarked it in my google bookmarks to visit then. Hey there. I discovered your blog by the use of Google at the same time as looking for a related subject, your web site got here up. It looks great. I’ve bookmarked it in my google bookmarks to come back then. Hey there. I discovered your blog via Google while looking for a related topic, your web site came up. It appears to be good. I’ve bookmarked it in my google bookmarks to come back then. Valuable information. Fortunate me I discovered your website by accident, and I’m shocked why this accident did not came about earlier! I bookmarked it. I together with my friends have already been analyzing the excellent points on the website while at once developed an awful feeling I never thanked the website owner for those techniques. Most of the people came so joyful to learn them and now have quite simply been loving them. I appreciate you for truly being so considerate as well as for obtaining some superb information most people are really desperate to discover. My personal sincere apologies for not saying thanks to sooner. I¡¦ve read some just right stuff here. Definitely price bookmarking for revisiting. I surprise how a lot attempt you set to make the sort of great informative web site. Thanks a lot for sharing this with all folks you really recognise what you’re talking approximately! Bookmarked. Kindly additionally visit my website =). We can have a link trade contract between us! Thanks for every other informative web site. Where else may just I am getting that kind of info written in such an ideal approach? I’ve a project that I’m just now working on, and I have been on the look out for such info. Hiya, I am really glad I’ve found this information. Nowadays bloggers publish just about gossip and web stuff and this is actually frustrating. A good site with interesting content, that’s what I need. Thank you for making this site, and I will be visiting again. Do you do newsletters by email? Hiya, I’m really glad I’ve found this info. Today bloggers publish only about gossip and net stuff and this is actually frustrating. A good web site with interesting content, this is what I need. Thanks for making this website, and I’ll be visiting again. Do you do newsletters by email? Hey there. I discovered your website by means of Google while looking for a related matter, your web site came up. It seems good. I’ve bookmarked it in my google bookmarks to come back then. Wonderful goods from you, man. I have understand your stuff previous to and you’re just too magnificent. I really like what you’ve acquired here, really like what you are stating and the way in which you say it. You make it entertaining and you still take care of to keep it sensible. I can not wait to read far more from you. This is really a tremendous website. I must show my appreciation for your generosity for those individuals that really need guidance on this one subject. Your personal dedication to getting the message all over became amazingly invaluable and has truly helped guys and women just like me to achieve their targets. Your personal informative key points implies a lot a person like me and further more to my colleagues. Best wishes; from each one of us. Hiya, I’m really glad I have found this information. Today bloggers publish only about gossip and net stuff and this is actually annoying. A good web site with exciting content, that’s what I need. Thank you for making this site, and I will be visiting again. Do you do newsletters by email? Hello there. I found your web site by the use of Google at the same time as searching for a related matter, your site got here up. It seems to be good. I have bookmarked it in my google bookmarks to come back then. Hey there. I found your blog by means of Google whilst looking for a similar matter, your website came up. It seems great. I have bookmarked it in my google bookmarks to visit then. Hi there. I found your web site by the use of Google even as looking for a related matter, your web site got here up. It seems good. I have bookmarked it in my google bookmarks to visit then. Hiya, I am really glad I’ve found this info. Nowadays bloggers publish just about gossip and web stuff and this is actually frustrating. A good web site with exciting content, that is what I need. Thanks for making this web site, and I’ll be visiting again. Do you do newsletters by email? Hello there. I found your site by the use of Google while looking for a related matter, your website came up. It looks great. I have bookmarked it in my google bookmarks to come back then. Hey there. I discovered your blog by way of Google even as looking for a comparable subject, your website came up. It seems good. I’ve bookmarked it in my google bookmarks to come back then. Hey there. I discovered your site by way of Google whilst searching for a comparable topic, your website got here up. It appears great. I’ve bookmarked it in my google bookmarks to visit then. Hi there. I found your website by the use of Google whilst looking for a comparable matter, your web site got here up. It seems to be great. I have bookmarked it in my google bookmarks to come back then. Hey there. I found your site by way of Google whilst searching for a similar subject, your website got here up. It appears good. I have bookmarked it in my google bookmarks to come back then. Hey there. I found your site by means of Google at the same time as searching for a related subject, your web site came up. It looks great. I’ve bookmarked it in my google bookmarks to visit then. Hi there. I found your website via Google whilst searching for a similar topic, your web site came up. It seems great. I’ve bookmarked it in my google bookmarks to visit then. What i don’t realize is in truth how you are no longer really a lot more neatly-appreciated than you might be right now. You’re very intelligent. You realize thus significantly with regards to this matter, made me for my part imagine it from numerous numerous angles. Its like women and men are not interested until it¡¦s something to accomplish with Woman gaga! Your individual stuffs excellent. Always maintain it up! Hey there. I discovered your web site by means of Google even as looking for a similar matter, your web site got here up. It appears to be great. I’ve bookmarked it in my google bookmarks to come back then. Hello there. I discovered your website via Google while searching for a comparable topic, your web site got here up. It seems to be great. I’ve bookmarked it in my google bookmarks to come back then. Hello there. I discovered your blog by way of Google while searching for a comparable matter, your web site came up. It seems to be good. I have bookmarked it in my google bookmarks to come back then. Hiya, I am really glad I have found this information. Today bloggers publish only about gossip and internet stuff and this is actually annoying. A good site with interesting content, that’s what I need. Thanks for making this site, and I’ll be visiting again. Do you do newsletters by email? Hi there. I discovered your site via Google while looking for a related topic, your web site came up. It appears to be great. I have bookmarked it in my google bookmarks to visit then. Hey there. I discovered your site by way of Google even as searching for a comparable subject, your website came up. It seems to be good. I’ve bookmarked it in my google bookmarks to visit then. Hello there. I discovered your site via Google at the same time as searching for a similar topic, your web site came up. It appears good. I’ve bookmarked it in my google bookmarks to come back then. Hey there. I discovered your web site by means of Google whilst looking for a comparable subject, your web site came up. It seems good. I have bookmarked it in my google bookmarks to visit then. Thanks for any other wonderful article. Where else could anyone get that type of info in such a perfect approach of writing? I have a presentation subsequent week, and I’m on the search for such information. Very good written post. It will be useful to anybody who employess it, including me. Keep up the good work – looking forward to more posts. I would like to thnkx for the efforts you’ve put in writing this site. I’m hoping the same high-grade site post from you in the upcoming as well. In fact your creative writing abilities has encouraged me to get my own blog now. Actually the blogging is spreading its wings rapidly. Your write up is a great example of it. Hiya, I am really glad I’ve found this information. Nowadays bloggers publish only about gossip and internet stuff and this is really irritating. A good website with exciting content, that’s what I need. Thank you for making this site, and I’ll be visiting again. Do you do newsletters by email? Hey there. I discovered your site by way of Google while searching for a similar subject, your site got here up. It looks good. I’ve bookmarked it in my google bookmarks to come back then. Hey there. I discovered your website by way of Google at the same time as looking for a comparable matter, your web site came up. It appears to be good. I have bookmarked it in my google bookmarks to come back then. Hello there. I found your site via Google even as searching for a similar topic, your site came up. It appears good. I’ve bookmarked it in my google bookmarks to come back then. Hiya, I am really glad I’ve found this information. Today bloggers publish only about gossip and web stuff and this is really irritating. A good blog with interesting content, this is what I need. Thanks for making this site, and I’ll be visiting again. Do you do newsletters by email? Hiya, I’m really glad I have found this information. Today bloggers publish just about gossip and web stuff and this is really annoying. A good website with interesting content, this is what I need. Thanks for making this web-site, and I’ll be visiting again. Do you do newsletters by email? Hello there. I found your web site via Google at the same time as looking for a comparable matter, your website got here up. It appears to be great. I’ve bookmarked it in my google bookmarks to visit then. My wife and i ended up being so joyful Chris managed to deal with his investigations through your ideas he gained from your web site. It is now and again perplexing to just happen to be giving out methods men and women might have been trying to sell. We consider we’ve got the blog owner to thank for this. The entire explanations you have made, the straightforward web site menu, the relationships you can aid to engender – it’s most terrific, and it’s leading our son and us believe that that article is entertaining, and that is particularly serious. Many thanks for everything! I do believe all of the concepts you’ve offered in your post. They’re really convincing and can certainly work. Nonetheless, the posts are very quick for novices. May just you please extend them a little from next time? Thank you for the post. Hiya, I am really glad I’ve found this information. Nowadays bloggers publish only about gossip and net stuff and this is really irritating. A good website with exciting content, that is what I need. Thanks for making this web-site, and I will be visiting again. Do you do newsletters by email? Hi there. I discovered your web site by way of Google whilst looking for a related topic, your web site came up. It appears to be good. I have bookmarked it in my google bookmarks to come back then. Hello there. I found your website by means of Google at the same time as looking for a related topic, your site got here up. It seems to be great. I have bookmarked it in my google bookmarks to visit then. fantastic submit, very informative. I wonder why the other experts of this sector don’t understand this. You should continue your writing. I’m confident, you have a great readers’ base already! Thank you a lot for sharing this with all folks you really recognise what you are speaking approximately! Bookmarked. Kindly additionally talk over with my website =). We may have a hyperlink trade agreement among us! Hey there. I discovered your web site via Google even as looking for a similar matter, your web site got here up. It looks good. I have bookmarked it in my google bookmarks to come back then. Hi there. I found your web site by means of Google whilst looking for a similar subject, your web site came up. It looks good. I have bookmarked it in my google bookmarks to come back then. Hi there. I discovered your site by means of Google at the same time as searching for a comparable topic, your website came up. It seems great. I have bookmarked it in my google bookmarks to visit then. Hello there. I found your blog by way of Google while searching for a similar subject, your web site got here up. It seems to be good. I’ve bookmarked it in my google bookmarks to come back then. Hello there. I found your website by way of Google even as searching for a similar subject, your web site came up. It looks good. I have bookmarked it in my google bookmarks to come back then. Hello there. I found your site by means of Google at the same time as looking for a related topic, your site got here up. It looks great. I have bookmarked it in my google bookmarks to visit then. Hiya, I’m really glad I’ve found this info. Nowadays bloggers publish only about gossip and net stuff and this is actually annoying. A good site with interesting content, that’s what I need. Thanks for making this website, and I’ll be visiting again. Do you do newsletters by email? I just want to mention I am just new to blogging and site-building and actually liked this blog site. Probably I’m planning to bookmark your site . You actually come with beneficial articles. Cheers for sharing with us your blog. Hello there. I discovered your web site by way of Google even as searching for a similar matter, your web site came up. It seems great. I’ve bookmarked it in my google bookmarks to visit then. Hey there. I discovered your site via Google whilst searching for a comparable subject, your site got here up. It appears good. I have bookmarked it in my google bookmarks to come back then. Hiya, I’m really glad I’ve found this info. Today bloggers publish only about gossip and net stuff and this is really annoying. A good website with exciting content, this is what I need. Thank you for making this web-site, and I’ll be visiting again. Do you do newsletters by email? Hello there. I found your site by the use of Google at the same time as looking for a related topic, your site came up. It looks good. I have bookmarked it in my google bookmarks to visit then. Hi there very cool website!! Guy .. Beautiful .. Amazing .. I will bookmark your website and take the feeds additionally¡KI am glad to find so many useful information right here in the submit, we need develop extra techniques in this regard, thank you for sharing. . . . . .
Hiya, I’m really glad I’ve found this information. Today bloggers publish only about gossip and internet stuff and this is really annoying. A good web site with exciting content, that’s what I need. Thanks for making this site, and I will be visiting again. Do you do newsletters by email? Hello there. I discovered your web site by way of Google while searching for a comparable topic, your web site got here up. It looks good. I’ve bookmarked it in my google bookmarks to come back then. Hey there. I found your web site by the use of Google while searching for a comparable matter, your website got here up. It appears to be good. I’ve bookmarked it in my google bookmarks to visit then. Hello there. I found your website by means of Google while looking for a comparable matter, your web site came up. It seems good. I have bookmarked it in my google bookmarks to visit then. Hi there. I found your blog via Google while searching for a comparable topic, your web site got here up. It appears to be great. I have bookmarked it in my google bookmarks to visit then. Hiya, I am really glad I have found this information. Nowadays bloggers publish only about gossip and internet stuff and this is really irritating. A good site with exciting content, this is what I need. Thanks for making this site, and I’ll be visiting again. Do you do newsletters by email? Hi there. I discovered your website by way of Google while searching for a similar matter, your web site came up. It looks good. I’ve bookmarked it in my google bookmarks to visit then. Hey there. I discovered your site via Google whilst looking for a similar topic, your web site came up. It appears good. I’ve bookmarked it in my google bookmarks to visit then. Hello there. I discovered your website via Google at the same time as looking for a similar matter, your website got here up. It seems great. I’ve bookmarked it in my google bookmarks to visit then. Hello there. I discovered your website by way of Google whilst searching for a comparable subject, your web site came up. It looks good. I have bookmarked it in my google bookmarks to come back then. Hello there. I found your blog by means of Google even as looking for a related matter, your site came up. It looks great. I’ve bookmarked it in my google bookmarks to come back then. Hello there. I discovered your web site via Google at the same time as looking for a similar topic, your web site got here up. It looks great. I’ve bookmarked it in my google bookmarks to visit then. fantastic points altogether, you just received a new reader. What may you suggest in regards to your post that you just made some days ago? Any certain? wonderful publish, very informative. I’m wondering why the other specialists of this sector do not realize this. You must continue your writing. I’m sure, you’ve a huge readers’ base already! Hiya, I am really glad I’ve found this information. Nowadays bloggers publish just about gossip and internet stuff and this is really irritating. A good blog with interesting content, that is what I need. Thank you for making this web-site, and I’ll be visiting again. Do you do newsletters by email? Great site. Lots of helpful info here. I am sending it to some buddies ans additionally sharing in delicious. And of course, thank you for your effort! Hi there. I found your web site by the use of Google even as looking for a related topic, your site came up. It seems great. I have bookmarked it in my google bookmarks to visit then. Hiya, I’m really glad I have found this information. Today bloggers publish only about gossip and web stuff and this is really irritating. A good blog with interesting content, that’s what I need. Thank you for making this web site, and I will be visiting again. Do you do newsletters by email? Hello there. I found your site by way of Google whilst searching for a related matter, your website came up. It appears great. I’ve bookmarked it in my google bookmarks to come back then. Hiya, I am really glad I’ve found this information. Today bloggers publish only about gossip and net stuff and this is actually irritating. A good blog with exciting content, that is what I need. Thanks for making this website, and I will be visiting again. Do you do newsletters by email? Hiya, I’m really glad I have found this info. Today bloggers publish just about gossip and web stuff and this is really irritating. A good site with exciting content, this is what I need. Thank you for making this web-site, and I’ll be visiting again. Do you do newsletters by email? Hello there. I found your blog by means of Google even as looking for a related matter, your web site came up. It appears to be great. I have bookmarked it in my google bookmarks to come back then. Hey there. I discovered your site by the use of Google at the same time as searching for a related subject, your web site came up. It seems great. I have bookmarked it in my google bookmarks to come back then. Hello there. I discovered your website by means of Google even as searching for a related subject, your site came up. It seems good. I have bookmarked it in my google bookmarks to visit then. Hey there. I discovered your site by the use of Google whilst searching for a comparable subject, your site got here up. It seems good. I’ve bookmarked it in my google bookmarks to come back then. Whats Taking place i am new to this, I stumbled upon this I have found It absolutely helpful and it has helped me out loads. I hope to give a contribution & help other customers like its aided me. Good job. excellent publish, very informative. I wonder why the opposite specialists of this sector don’t realize this. You must continue your writing. I am sure, you’ve a great readers’ base already! Hiya, I’m really glad I’ve found this info. Nowadays bloggers publish just about gossip and internet stuff and this is actually frustrating. A good site with exciting content, that is what I need. Thanks for making this site, and I will be visiting again. Do you do newsletters by email? Hiya, I am really glad I have found this info. Nowadays bloggers publish just about gossip and web stuff and this is actually annoying. A good site with exciting content, that’s what I need. Thanks for making this site, and I’ll be visiting again. Do you do newsletters by email? Hey there. I found your site via Google while looking for a comparable matter, your web site came up. It looks good. I’ve bookmarked it in my google bookmarks to come back then. Hiya, I am really glad I’ve found this info. Today bloggers publish only about gossip and web stuff and this is really irritating. A good blog with exciting content, this is what I need. Thanks for making this website, and I will be visiting again. Do you do newsletters by email? Hey there. I discovered your blog via Google while looking for a related subject, your website got here up. It appears good. I have bookmarked it in my google bookmarks to come back then. Hi there. I found your blog by the use of Google whilst looking for a related matter, your site came up. It appears great. I have bookmarked it in my google bookmarks to come back then. Hi there. I discovered your web site by means of Google even as looking for a related matter, your site got here up. It seems to be good. I have bookmarked it in my google bookmarks to come back then. Hi there. I discovered your site by way of Google at the same time as looking for a related subject, your site got here up. It seems great. I’ve bookmarked it in my google bookmarks to come back then. A lot of thanks for all of the labor on this web page. My mom takes pleasure in carrying out investigation and it is easy to see why. Many of us hear all of the powerful mode you produce very important guides via your web blog and therefore increase response from the others about this point and our daughter is actually being taught a lot. Take pleasure in the rest of the new year. You’re performing a superb job. whoah this blog is great i love studying your posts. Stay up the great paintings! You already know, lots of individuals are searching around for this information, you could aid them greatly. Hello there. I discovered your website by way of Google even as looking for a related subject, your website came up. It appears great. I’ve bookmarked it in my google bookmarks to visit then. Hey there. I found your blog by way of Google even as looking for a similar topic, your web site came up. It seems to be great. I have bookmarked it in my google bookmarks to visit then. Hiya, I’m really glad I’ve found this info. Nowadays bloggers publish only about gossip and web stuff and this is actually irritating. A good website with exciting content, this is what I need. Thank you for making this web site, and I’ll be visiting again. Do you do newsletters by email? Hiya, I am really glad I have found this info. Today bloggers publish just about gossip and internet stuff and this is actually irritating. A good blog with interesting content, that’s what I need. Thank you for making this site, and I will be visiting again. Do you do newsletters by email? Hiya, I’m really glad I’ve found this info. Nowadays bloggers publish only about gossip and net stuff and this is actually irritating. A good website with exciting content, this is what I need. Thank you for making this web-site, and I will be visiting again. Do you do newsletters by email? Hi there. I discovered your blog by means of Google at the same time as searching for a similar subject, your site came up. It seems to be good. I have bookmarked it in my google bookmarks to visit then. Hiya, I’m really glad I have found this information. Today bloggers publish only about gossip and net stuff and this is really frustrating. A good web site with exciting content, that is what I need. Thanks for making this web-site, and I will be visiting again. Do you do newsletters by email? Hiya, I am really glad I’ve found this information. Today bloggers publish just about gossip and internet stuff and this is actually annoying. A good site with interesting content, that’s what I need. Thanks for making this web-site, and I’ll be visiting again. Do you do newsletters by email? Hello there. I found your web site by way of Google whilst searching for a similar subject, your web site got here up. It seems to be good. I’ve bookmarked it in my google bookmarks to come back then. Hiya, I am really glad I have found this information. Today bloggers publish just about gossip and net stuff and this is actually irritating. A good website with interesting content, this is what I need. Thank you for making this website, and I will be visiting again. Do you do newsletters by email? Hi there. I discovered your web site via Google even as searching for a comparable topic, your web site got here up. It appears great. I have bookmarked it in my google bookmarks to visit then. Hi there. I found your site by the use of Google while searching for a similar topic, your website got here up. It appears to be great. I’ve bookmarked it in my google bookmarks to visit then. Hiya, I am really glad I have found this information. Nowadays bloggers publish only about gossip and net stuff and this is actually annoying. A good website with exciting content, that’s what I need. Thank you for making this web site, and I’ll be visiting again. Do you do newsletters by email? Hey there. I discovered your site via Google while searching for a similar matter, your web site came up. It appears to be good. I’ve bookmarked it in my google bookmarks to visit then. Wonderful web site. A lot of useful information here. I¡¦m sending it to several pals ans additionally sharing in delicious. And certainly, thanks on your effort! Hi there. I found your website via Google even as searching for a similar subject, your site came up. It seems good. I’ve bookmarked it in my google bookmarks to visit then. Hi there. I found your site by means of Google even as looking for a comparable matter, your website came up. It seems to be good. I’ve bookmarked it in my google bookmarks to come back then. Hello there. I discovered your site by means of Google whilst searching for a similar topic, your web site got here up. It looks good. I have bookmarked it in my google bookmarks to visit then. Hiya, I am really glad I’ve found this information. Nowadays bloggers publish only about gossip and net stuff and this is actually irritating. A good web site with exciting content, that’s what I need. Thanks for making this web site, and I’ll be visiting again. Do you do newsletters by email? Hey there. I found your website by means of Google at the same time as looking for a related matter, your site came up. It appears to be good. I have bookmarked it in my google bookmarks to visit then. Hiya, I’m really glad I have found this info. Today bloggers publish only about gossip and web stuff and this is really annoying. A good site with exciting content, this is what I need. Thanks for making this web site, and I’ll be visiting again. Do you do newsletters by email? Hi there. I found your blog by way of Google while looking for a similar subject, your website got here up. It looks good. I have bookmarked it in my google bookmarks to visit then. Hi there. I discovered your site via Google whilst looking for a related topic, your site came up. It seems to be great. I have bookmarked it in my google bookmarks to visit then. Hiya, I’m really glad I’ve found this information. Nowadays bloggers publish just about gossip and net stuff and this is really irritating. A good blog with exciting content, this is what I need. Thanks for making this site, and I’ll be visiting again. Do you do newsletters by email? Hello there. I found your blog by the use of Google at the same time as searching for a similar matter, your web site came up. It appears great. I have bookmarked it in my google bookmarks to come back then. Hi there. I discovered your website by the use of Google while searching for a similar matter, your web site got here up. It seems to be great. I have bookmarked it in my google bookmarks to visit then. Hello there. I discovered your web site by the use of Google at the same time as looking for a similar subject, your web site came up. It seems to be good. I’ve bookmarked it in my google bookmarks to come back then. Hey there. I discovered your website by means of Google whilst searching for a similar subject, your website came up. It appears to be great. I’ve bookmarked it in my google bookmarks to come back then. Hi there. I found your blog by the use of Google whilst looking for a related matter, your site came up. It looks good. I have bookmarked it in my google bookmarks to come back then. Hiya, I’m really glad I have found this information. Nowadays bloggers publish just about gossip and internet stuff and this is actually irritating. A good site with interesting content, this is what I need. Thank you for making this web-site, and I will be visiting again. Do you do newsletters by email? Hiya, I’m really glad I’ve found this information. Nowadays bloggers publish only about gossips and web and this is really annoying. A good site with interesting content, that’s what I need. Thanks for keeping this web-site, I’ll be visiting it. Do you do newsletters? Cant find it. Thanks for each of your effort on this web page. My aunt really likes engaging in investigations and it is simple to grasp why. A number of us hear all regarding the compelling ways you deliver insightful suggestions through this web site and invigorate response from other ones about this concern plus our own child is in fact being taught a whole lot. Have fun with the rest of the new year. You’re carrying out a splendid job. Hi there. I discovered your web site via Google while looking for a related matter, your website came up. It looks good. I have bookmarked it in my google bookmarks to visit then. Hey there. I found your web site by the use of Google at the same time as searching for a similar subject, your web site got here up. It seems to be good. I’ve bookmarked it in my google bookmarks to visit then. Hi there. I discovered your website by the use of Google at the same time as looking for a comparable matter, your website came up. It seems great. I’ve bookmarked it in my google bookmarks to come back then. Hi there. I discovered your blog by means of Google while searching for a similar subject, your site got here up. It appears great. I have bookmarked it in my google bookmarks to visit then. Hi there. I discovered your web site by means of Google while searching for a similar topic, your website got here up. It seems to be good. I’ve bookmarked it in my google bookmarks to come back then. Hey there. I discovered your blog via Google at the same time as looking for a related topic, your web site got here up. It looks great. I have bookmarked it in my google bookmarks to visit then. Hi there. I discovered your website via Google at the same time as looking for a similar subject, your website got here up. It appears great. I have bookmarked it in my google bookmarks to visit then. Hiya, I’m really glad I have found this information. Nowadays bloggers publish only about gossip and internet stuff and this is actually irritating. A good website with interesting content, that is what I need. Thank you for making this web site, and I will be visiting again. Do you do newsletters by email? I like Facebook, however I dislike that their notes section isn’t as attractive as MySpace’s blogs. I have actually recently moved a blog from MySpace to Facebook making use of the “share” icon situated under each blog site … Nonetheless, I do not such as the way it shows up on my Facebook web page. Exist any type of far better ways to import my blog sites?. Hello there. I discovered your website by the use of Google whilst looking for a comparable topic, your website came up. It seems good. I’ve bookmarked it in my google bookmarks to visit then. Hello there. I found your site by way of Google at the same time as looking for a similar subject, your site got here up. It seems good. I have bookmarked it in my google bookmarks to visit then. Hiya, I am really glad I have found this info. Nowadays bloggers publish only about gossip and internet stuff and this is really annoying. A good blog with exciting content, that’s what I need. Thank you for making this site, and I’ll be visiting again. Do you do newsletters by email? Hey there. I found your website by means of Google whilst looking for a comparable subject, your web site got here up. It looks great. I’ve bookmarked it in my google bookmarks to come back then. Hiya, I’m really glad I’ve found this info. Today bloggers publish just about gossip and web stuff and this is actually irritating. A good website with interesting content, that’s what I need. Thanks for making this web-site, and I will be visiting again. Do you do newsletters by email? Hiya, I am really glad I’ve found this information. Nowadays bloggers publish only about gossip and internet stuff and this is actually frustrating. A good blog with exciting content, that is what I need. Thanks for making this site, and I will be visiting again. Do you do newsletters by email? Hey there. I found your blog via Google even as looking for a related matter, your website got here up. It appears great. I have bookmarked it in my google bookmarks to visit then. Hi there. I discovered your web site via Google whilst looking for a similar matter, your website got here up. It seems good. I’ve bookmarked it in my google bookmarks to visit then. Hiya, I’m really glad I’ve found this info. Nowadays bloggers publish just about gossip and net stuff and this is really irritating. A good site with interesting content, this is what I need. Thanks for making this web site, and I’ll be visiting again. Do you do newsletters by email? Hello there. I discovered your website via Google even as looking for a related topic, your site came up. It looks great. I’ve bookmarked it in my google bookmarks to come back then. Hello there. I found your website by means of Google while searching for a comparable subject, your website came up. It looks great. I’ve bookmarked it in my google bookmarks to come back then. Hello there. I discovered your blog by the use of Google whilst searching for a comparable subject, your web site came up. It seems great. I have bookmarked it in my google bookmarks to come back then. Hi there. I discovered your site by the use of Google even as searching for a related matter, your web site got here up. It looks good. I have bookmarked it in my google bookmarks to visit then. Hey there. I found your site via Google even as looking for a comparable subject, your site came up. It looks great. I’ve bookmarked it in my google bookmarks to visit then. Hello there. I found your website by the use of Google whilst looking for a related subject, your site got here up. It seems good. I’ve bookmarked it in my google bookmarks to visit then. Hello there. I found your blog by way of Google while looking for a related matter, your website came up. It seems to be great. I’ve bookmarked it in my google bookmarks to come back then. I wanted to create you this very little observation in order to thank you very much over again about the spectacular knowledge you’ve shared on this website. This is particularly open-handed with people like you to convey openly all a lot of people would’ve offered for an electronic book to end up making some dough for themselves, specifically seeing that you could have tried it in the event you desired. The strategies likewise worked like a fantastic way to realize that other people online have similar zeal really like my own to know much more with reference to this problem. I am certain there are many more enjoyable opportunities in the future for individuals who go through your blog post. Hello there. I found your web site by the use of Google whilst looking for a related matter, your website got here up. It looks great. I have bookmarked it in my google bookmarks to visit then. Hey there. I discovered your website by means of Google whilst searching for a comparable matter, your web site got here up. It seems great. I’ve bookmarked it in my google bookmarks to visit then. Hiya, I am really glad I have found this information. Today bloggers publish just about gossip and internet stuff and this is actually frustrating. A good blog with exciting content, that’s what I need. Thank you for making this web site, and I’ll be visiting again. Do you do newsletters by email? Hiya, I am really glad I’ve found this information. Today bloggers publish only about gossip and web stuff and this is actually frustrating. A good site with exciting content, that is what I need. Thanks for making this website, and I will be visiting again. Do you do newsletters by email? Hello there. I discovered your blog via Google even as searching for a similar topic, your site came up. It appears to be great. I have bookmarked it in my google bookmarks to visit then. Hi there. I found your web site by the use of Google at the same time as looking for a similar subject, your site came up. It seems to be great. I have bookmarked it in my google bookmarks to come back then. Hi there. I found your web site by way of Google while looking for a similar subject, your website came up. It seems good. I’ve bookmarked it in my google bookmarks to come back then. Hello there. I found your website by way of Google whilst searching for a similar subject, your website got here up. It looks good. I’ve bookmarked it in my google bookmarks to come back then. Hi there. I discovered your site via Google whilst looking for a comparable topic, your site got here up. It seems to be great. I’ve bookmarked it in my google bookmarks to come back then. Hi there. I discovered your site by the use of Google even as searching for a comparable subject, your web site came up. It appears to be good. I have bookmarked it in my google bookmarks to come back then. Hi there. I found your blog by the use of Google even as searching for a related subject, your site came up. It looks good. I’ve bookmarked it in my google bookmarks to visit then.